Sharing the passion of cooking! 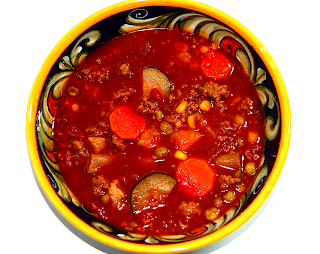 When I was growing up my mother would make hamburger stew. The reason why she used hamburger was because it was cheaper than stew meat! She had a lot of little kids to feed as I am the youngest of five. Of course she makes her with whole lot more vegetables and macaroni. I think she used it as an excuse to clean out the refrigerator! 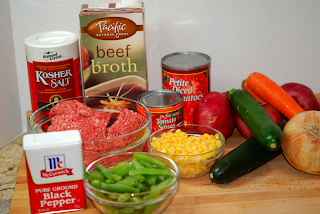 So today with it being wet and cold outside I thought some hamburger stew was in order. So here it is! By the way, Miss Holland loved the stew along with the cornbread she helped her Ahma make. 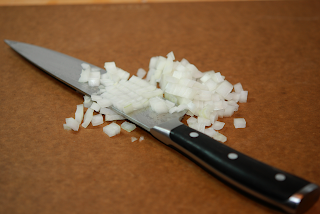 Chop onions and add to the ground beef in a large stockpot. Over medium heat, brown the meat and onion, drain. Wipe excess oil from pot and return meat to the pot. 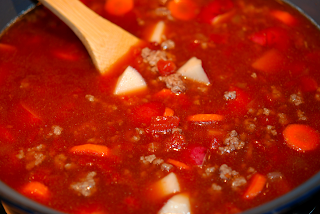 Add tomatoes, tomato sauce, beef broth, carrots and potatoes to meat mixture and begin simmering for about 30 minutes. Then add remaining vegetables (green beans, corn, green peas and zucchini) to the pot and continue simmering for another 30 minutes. The longer you simmer the more intense the flavors. How about that shot of the finished stew! Happy Eating. 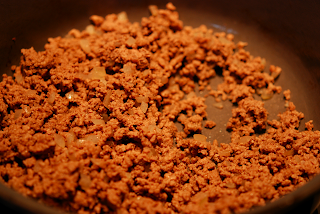 Use a large Dutch oven or stockpot, add ground beef, chopped onion and cook on medium heat until beef is browned. Drain meat and wipe out pan with paper towel to remove any excess grease. 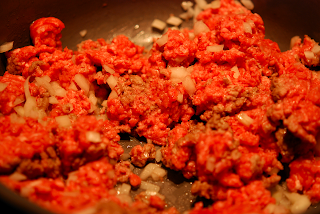 Add meat back to pan. 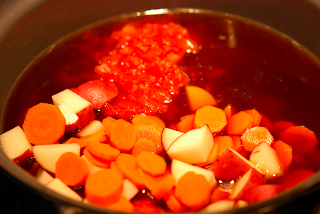 Then add beef broth, diced tomatoes, tomato sauce, potatoes and carrots. 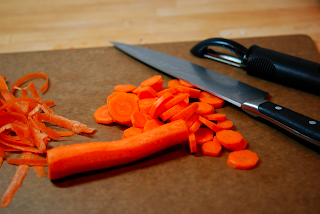 Cook for about 30 minutes until potatoes and carrots are fork tender. Then add all the other vegetable to the pot along with 2 tablespoons of chili powder. Season with salt and pepper to taste. Simmer for a minimum of 1 hour stirring occasionally. The longer it simmers the more intense the flavor will be. I usually serve this with cornbread or crackers. 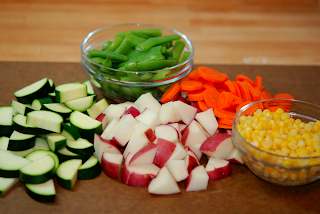 Note: Wait to add corn, green beans, zucchini and green peas until potatoes and carrot are tender because the other vegetables do not take as long to cook. For vegetarians, omit the beef and beef broth. 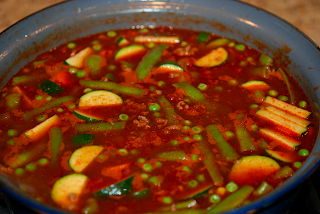 Use vegetable broth and all the other ingredients and you will have a nice vegetable soup.